(Newser) – A species of frog so tiny that several of them could fit on a fingernail with room to spare has been found hopping around the forests of Papua New Guinea. 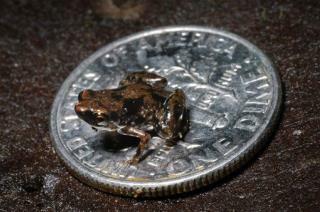 At 0.27 inches long, Paedophryne amauensis is the smallest frog ever discovered and, by some measures, is the world's smallest vertebrate. The only smaller creature with a backbone is the male of a species of anglerfish, but they spend their lives fused to much larger females. Can you even imagine the cost of a plate of frogs' legs in a fancy New York restaurant?